Keep your products fresh and cool when things get heated! At Fresh Wheels we understand the challenges associated with delivering high quality events. Let us take the strain and ensure that you can store, prepare and serve food and drink at just the right temperature delighting your customers and guests. Our modern, reliable, temperature controlled refrigeration and freezer trailers take the stress out of your event freeing you up to concentrate on those wow factors that keep customers coming back and win you new business. 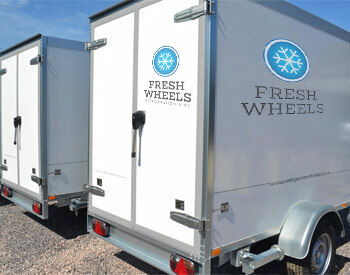 Fresh Wheels Refrigeration Hire Ltd offer a quality and professional hire service for both Fridge & Freezer trailers which are available to hire on a day, weekend, week or longer term basis starting from just £100 plus VAT*. Our easy to use units are delivered to your venue, located to your preferences and convenience alongside your catering facilities and are conveniently accessible . We offer trailers at a range of capacities all offering impeccable build quality and reliability and equipped with temperature controlled fridge/freezer unit, internal racking, interior switch lighting for use day and night and a load capacity the equivalent of 500 bottles of wine. Delivered to you after a full hygienic clean and then collected post event means one less element you need to worry about. Whatever event you're planning, give us a call and we'll happily provide a competitive quote. * ONLY within 15 miles of Uppingham.